The one-time force of nature delivers his second disappointing album. Let’s get something straight: Trespassing is not Adam Lambert’s “big gay dance-club album” (as one illustrious publication put it) any more than Savage Garden was Savage Garden’s big gay pop album or Songs from the West Coast was Elton John’s big gay roots album. With Trespassing, Lambert becomes the first out solo artist to score a number one album -- cigars all around! -- but queer identity barely shows up in the songs themselves. The pronouns are mostly “you”, and the innuendos pretty much top out at “straight jacket” and “Such a beautiful release / You inside of me”. Everything else -- ignoring “no trespassing” signs, partying all night, enjoying naked love -- is hedonism available any day of the week in Pink or Ke$ha songs, on classic rock radio or blues clubs or wherever. This isn’t a knock against the album; that’ll come in a minute. But taken at face value, Trespassing reads straight or gay: however you want it. Take the subject of “Kickin’ In”, the one who puts her shot glass down and asks for another round. If you hear her as a drag queen, you probably read about it on Twitter. Screw Twitter. I’m too busy trying to figure out whether the drag queen's friend Eddie, who's got words that rhyme and a dirty mind, is some outdated Ed Lover reference. Anyway, heard at face value, “Kickin’ In” is the best song here -- produced by Pharrell Williams in strutting MJ knockoff mode, with mysterious synth percussion that makes me laugh like his Britney jams did more than a decade ago. (Remember “Boys”? Now, don’t you think Glambert should cover it? Let’s start a petition.) Lambert sings in octaves, his party starter tenor laced with the menace of his impossibly clear falsetto. There’s a cool breakdown with a kaleidoscopic array of Glamberts leering and shouting, as though you’re viewing him through the bottom of an empty tumbler. Pharrell also produced the opener “Trespassing”, a funky march with handclaps and a bassline that swings like a Chic-y monkey. Speaking of Chic, guitar hero Nile Rogers shows up on “Shady”, a reasonably funky Lester Mendez production that inhabits the same freak-infested clubs as Ke$ha, with salacious vocal swoops out of the Pussycat Dolls’ “Buttons”. These songs are all on the album’s first half, seven uptempo dance tunes ranging from really good to pretty good (“Cuckoo”, “Naked Love”) to forgettable (“Pop That Lock”, inexplicable second single “Never Close Our Eyes”). The kick drums stomp; the synths are state-of-the-charts; song lengths fill a narrow range from 3:00 to 4:08. Here’s why I mention song lengths. Almost from the start of American Idol, fans and critics speculated about which contestant would use the show’s format to break molds and shift paradigms, or to rebel against the format itself. To date on Idol, only two contestants have fit the bill: Sanjaya Malakar, who demonstrated that the public has terrible taste, and Adam Lambert, who proved the opposite. Even Joshua Ledet, Season 11’s insanely talented gospel-soul screamer, fits the Idol mold: an attractive person singing a song well, usually in a way we’re accustomed to hearing it sung, and receiving a reward. In contrast, Lambert took over Season Eight, mentoring the other contestants, doling out his own rewards (“Mad World”) and punishments (“Ring of Fire”), and using the format to establish himself as the country’s most vital entertainer. Despite his second-place finish, he owned the show; he was bigger than the Simons. (Rolling Stone’s Rob Sheffield: “Having Adam around seems to cheer everybody up, including the other singers, who know the pressure's off. Hell, even Simon looks happy.”) If Season Eight -- or Idol itself -- is remembered artistically centuries from now, it’ll be for Glambert’s performances. After the season ended, the question -- the worry -- became, “How does he translate this persona into a recording career?” Idol gave Lambert the gift of constraints; he kept his songs to a certain length so the producers wouldn’t give him the stiletto boot, because what fun would that’ve been? He sang MJ and Johnny Cash because he had to, upending audience expectations in the process. On-stage, Lambert was a big-hearted rebel, but the show’s narrow parameters gave him something to rebel against. As my wife feverishly downloaded his singles, there was something disappointing about hearing “Black or White” apart from the Idol stage -- it simply sounded like a really good singer’s cover version, but not like the world historical chokehold of the previous night. So unfortunately, the answer to that worried question remains, “He hasn’t figured it out yet”. 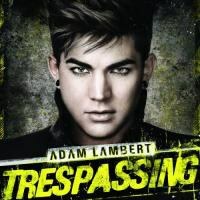 Like his first album For Your Entertainment, Trespassing disappoints because it’s Lambert playing on pop’s terms and sometimes narrowing the terms unnecessarily. He hires the same big-name Top 40 writers and producers that everyone hires -- heck, even Entertainment featured pomp-rock guys from The Darkness and Muse alongside Max Martin and Shellback. His songs all run about the same length -- yes, pop singles are supposed to be short, but pop albums from Erasure to Big & Rich to Madonna have been unafraid to stretch out musically. Trespassing deviates from the big beat formula on its second ballad-heavy half, notably on the lite industrial groove of “Chokehold” and the Wainwright-y falsetto warbling in “Outlaws of Love”. But “Outlaws”, like its neighbors in Ballad Land, isn’t much of a song. The second half gets pretty dispiriting, especially if you shell out for the version with three “bonus” tracks, which are like ending the school year with some bonus homework. Most worryingly, for all their talk of trespass and release and lock-popping, Glambert’s songs unleash very little Glambert. On the solemn ballad “Underneath”, Lambert sings, “Underneath, under my skin / Underneath the depths of my sin / Look at me, now do you see?” Well, no actually, we don’t. Not that Lambert needs to provide a blow-by-blow account of his “sin”, but most of his lyrics amount to workmanlike clichés. “Tower of Babel has fallen down again”; “Let’s just stay awake until we grow older”; “I’m swingin’ off of my hinges / I’m cocked and I’m ready to go” -- these ideas have been expressed better elsewhere and could’ve been expressed by anyone. I should also point out that the Five Man Electrical Band came up with more creative “No Trespassing” signs. So while I’m rooting for the guy and his amazingly versatile screeches, he still doesn’t know how to make pop music work for him, rather than the other way around. Other people do. Take the big gay examples from up top. Elton John’s “Original Sin” and Savage Garden’s “Santa Monica” are both strange and beautiful songs that become more poignant if you hear them as gay monologues. Lambert’s songs don’t work that way -- “Outlaws”, his closest contender, is too flatly written to achieve strangeness, beauty, or poignancy. But it’s not just old music that’s showing him up. This year in mainstream pop, fun., Graffiti6, and Dev have all packed their albums and singles with more weirdo personality than Glambert’s self-proclaimed “world of truth”. Whether his songs would improve with more queer self-expression is anyone’s guess, but he clearly needs to do something.